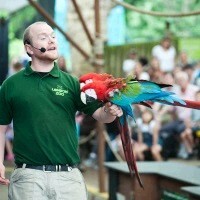 See what's new at London Zoo. Indulge your senses and engage your mind and with so many exciting animals, a day at London Zoo offers the ultimate back to nature experience and supports the active conservation of many amazing species. Watch out for the Happy Families area, where you can see meerkats keeping an eye on their neighbours from rocky outcrops. Watch the playful otters swimming gracefully underwater as they chase each other in and out of the pools and waterfalls. Visit the tapirs and see them enjoying their new pool in their indoor enclosure or see the endangered tamarins basking in the sunshine in their new outdoor enclosures. Learn more about the many ongoing conservation programmes that the zoo is involved in. You can experience conservation in action with a trip around B.U.G.S (biodiversity underpinning global survival) - an innovative exhibition dedicated to conservation and explanation of biodiversity. Experience the 'Animals in Action' display - 30 minutes of flying, foraging and leaping action with animals showing their amazing natural skills and abilities.